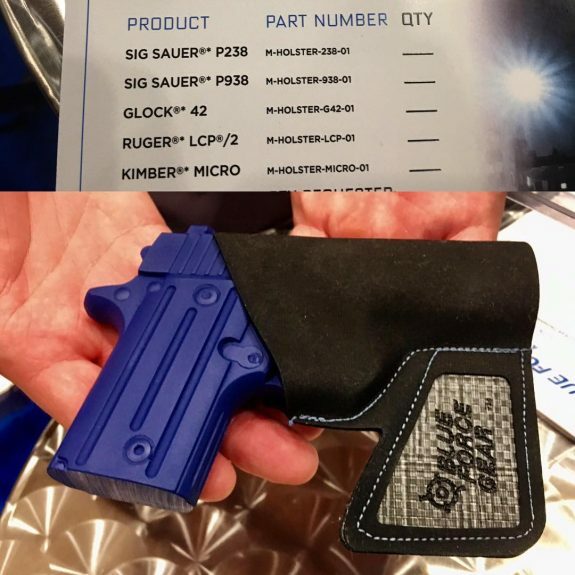 The ULTRAcomp Pocket Holster is one of a number of new products that Blue Force Gear is exhibiting at SHOT Show this year. The properties of Blue Force Gear’s proprietary ULTRAcomp material, from which the new holster is manufactured, make it very well suited for this application. A good pocket holster must keep the handgun oriented for a smooth draw and stay in the pocket while releasing the handgun during the drawstroke. The BFG ULTRAcomp Pocket Holster stays in the pocket via a hooked flare that physically grabs the pocket and the rubbery texture that is integral to the ULTRAcomp material itself. ULTRAcomp is also relatively thin compared to leather or kydex and very abrasion resistant so it adds little bulk and should last a long time. The holster will be available for a number of popular pocket guns and that list could expand before it hits the market. Stay tuned for additional information.